Metro UI Theme for Windows 7 is the latest update of Metro Style Theme we already published in our Downloads section. It is a Colorful Visual Style with Eye Candies. Metro UI Theme for Windows 7 is created by jaycee13. This is Third Party Windows 7 Theme or Visual Style for Windows 7. You can follow the instructions written within this Theme on how to install it. UPDATE 1 (06092011-0140) Fixed white/glass lining when using small taskbar. UPDATE 2 (06092011-0313) Fonts used. Click here to download the Font. You can follow this tutorial on how to install Fonts using Shortcut in Windows 7. Click here for bigger preview of Metro UI Theme for Windows 7. It is a RAR Download, the file is 8.2 MB in size. This Article Has Been Shared 1864 Times! 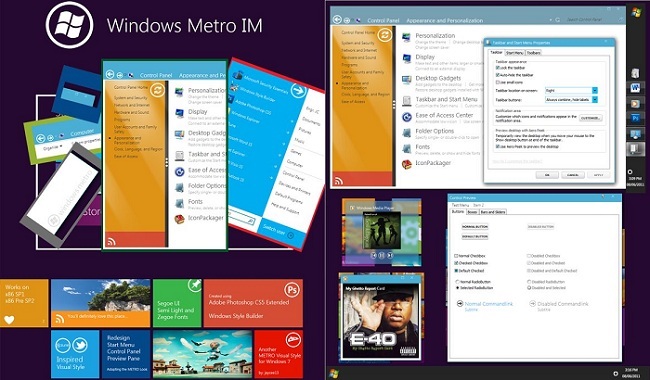 Cite this article as: Abhishek Ghosh, "Metro UI Theme for Windows 7-New Updated Version," in The Customize Windows, September 15, 2011, April 25, 2019, https://thecustomizewindows.com/2011/09/metro-ui-theme-for-windows-7-new-updated-version/.